Volume visualization software authored by Stefan Roettger. 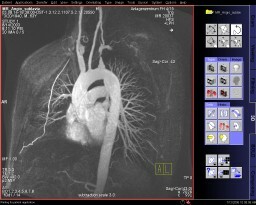 The V^3 uses the pre-integration technique to display regular volume data as provided by CT or MRI scanners. The volume renderer requires at minimum a NVIDIA GeForce4, a GeForce FX graphics accelerator (ATI is not supported). The stable version 2.2 runs on Linux and Windows (VC++ and cygwin). 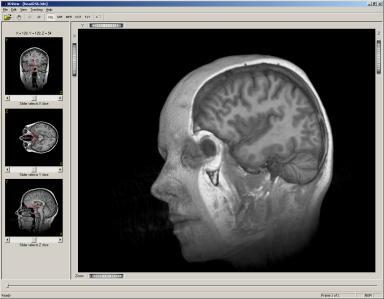 The latest version 2.3 also includes a DICOM loader for Windows. The source code is copyrighted by Stefan Roettger. Usage is free for scientific and private purposes. 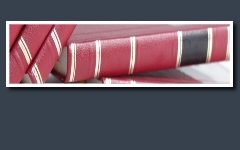 For commercial applications, permission of the author is required. Advanced 3D volume rendering viewer. MIPAV [Medical Image Processing, Analysis and Visualization] from the NIH is a powerful, promising and easy to use viewer. The application enables quantitative analysis and visualization of medical images of numerous modalities such as PET, MRI, CT, or microscopy. Using MIPAV s standard user-interface and analysis tools, researchers at remote sites (via the internet) can easily share research data and analyses, thereby enhancing their ability to research, diagnose, monitor, and treat medical disorders. This Java based application can run on many platforms (Windows, Mac, Linux, etc).